Russian space managers have ordered delays for upcoming manned Soyuz flights to the International Space Station in the wake of a test mishap that over pressurized and damaged the descent module of a Soyuz scheduled for launch March 30 to ferry three fresh crew members to the International Space Station, a senior NASA managers said Thursday. Mike Suffredini, manager of the space station program at the Johnson Space Center in Houston, said his Russian counterparts informed the station team they had decided to scrap the damaged descent module and to accelerate processing of the next downstream Soyuz to take its place. As a result, three of the station's current six crew members -- commander Daniel Burbank, Anton Shkaplerov and Anatoly Ivanishin -- will extend their stay in orbit by a month and a half and return to Earth April 30 and the crew that had planned to launch on March 30 -- Gennady Padalka, Sergei Revin and Joseph Acaba -- will be delayed to May 15. "During pressure testing of the descent module and the pressurized section of the propulsion module, the vehicle was over pressurized and as a result, it caused a leak in the area where the hydrogen peroxide system is housed for the thrusters that are used during descent and landing," Suffredini told reporters. "As a result of that, our Russian colleagues have chosen to not fly this particular vehicle and they've set it aside. A commission has been formed to try to figure out what the cause of the over pressure event was and how to make sure it doesn't happen in the future." The test mishap was the latest in a string of setbacks to rock the Russian space program in recent months, including the destruction of an unmanned Progress supply ship last August and the failure of a high-profile Mars probe launched in November that crashed back to Earth last month. 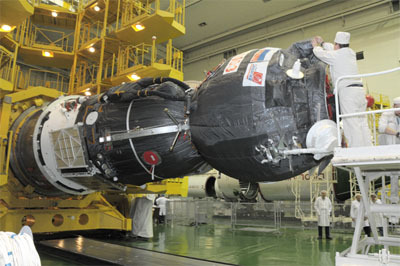 The Progress failure triggered a two-month launch delay for Burbank and his crewmates, shortening their stay aboard the station. The decision to extend their mission by six weeks in the wake of the Soyuz over pressurization mishap will result in a 168-day flight, just slightly less than the originally planned duration. Outside experts have questioned Russian quality control, but Suffredini said the problems appeared to be unrelated and he expressed confidence his counterparts will get to the bottom of the latest incident, implement corrective actions and move on. 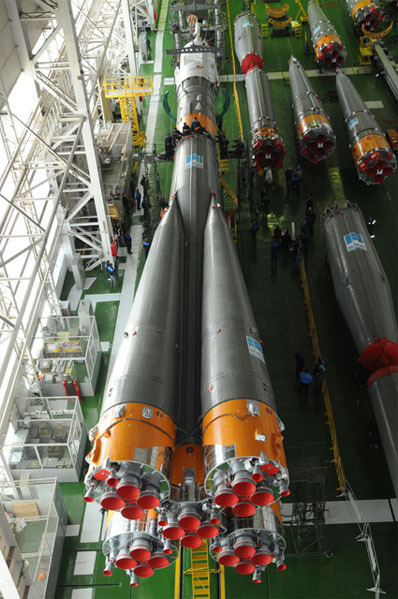 "Our Russian colleagues have had a number of challenges last year relative to launches," Suffredini said. "They take that very seriously and are trying to look for any consistent clues across the board. None of those incidents point toward the team that builds the Progress and Soyuz spacecraft themselves at Energia in Moscow. "This particular event is very unfortunate, but you know this is a complicated business and things happen. To me, this is not indicative of some over-arching problem at the Energia Corp. i do not know the cause, it could have been a regulator failure, could have been human error, they're of sorting that out. I have every confidence they'll figure out the cause of this and rectify it for the future." Discarding the Soyuz damaged in the pressure test and moving up downstream spacecraft will trigger delays for most of the year's remaining crew rotation flights. Acaba's crew, now tentatively scheduled for launch May 15, will use the Soyuz that had been slated for use by Sunita Williams, Yuri Malenchenko and Japanese astronaut Akihiko Hoshide. Williams and her crewmates, originally scheduled for launch May 30, now hope to take off around July 15 aboard a Soyuz originally scheduled for launch Sept. 26. The crew of that flight -- Oleg Novitskiy, Evgeni Tarelkin and Kevin Ford -- will use the next Soyuz in the sequence and take off around Oct. 15. The year's final flight, with Canadian astronaut Chris Hadfield, Thomas Marshburn and Yuri Romanenko, will slip from Nov. 26 to around Dec. 5. The launch delays will require several crews to extend their stays in orbit to help minimize the time the station has to be manned by a reduced crew if three. But overall, Suffredini said, the impact was minimal. "I have every confidence they will sort through this, figure out what the fix is in the process and ensure that future vehicles don't get damaged," he said.